is definitely one to try. The Body Wash comes in a large bottle of 500ml, so for £6.50, I think it is a really nice price for what you get, the bottle comes with a pump for easy application to your skin for those lovely, much needed shower and bath times. Its beautiful citrusy, fresh smells of green Mandarin, Sicilian Lemon and Orange Peels make pampering time so much more inviting. It creates a lovely Zesty and revitalising smell for both Morning and Night. Definitely one to purchase this Autumn/Winter time, if you want a massive pick me up through the dark, cold winter. I also purchased the Body Butter for £10 to put on after, to still keep the same beautiful aromas lingering on my body. It is presented in a large 300ml tub and you only have to use a tiny bit which goes a long way, a great product! After using these two products, I definitely want to buy the Orangeasm Super Tonic to complement them, as they are wonderful! 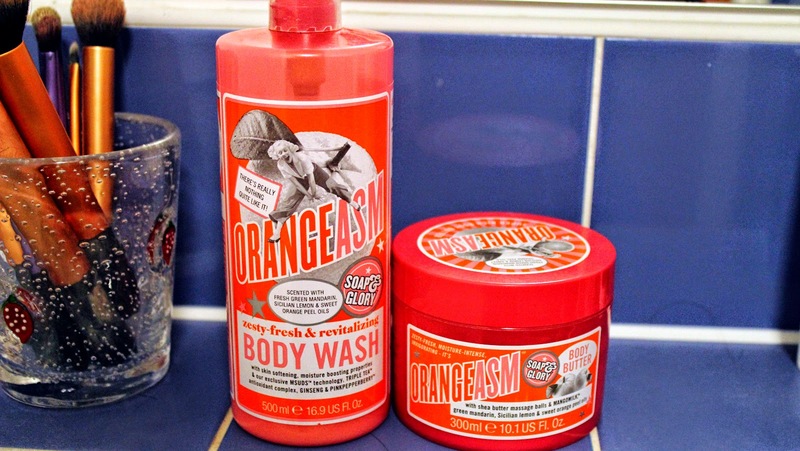 Have you tried the 'Orangeasm' range from Soap and Glory?